For ages 8 through 12. 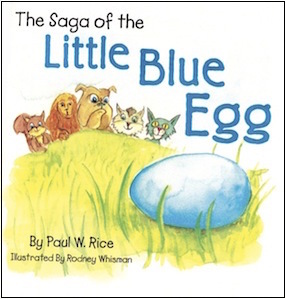 The Saga of The Little Blue Egg is a busy story about a new Robin couple that loses their first egg in a strong spring storm. The egg is saved by a passing leaf in a stream of water that over ran it's bank during the storm. The animal community, sensing their loss, gathers together to find the egg. It is finally found safe in a soft tuft of grass near the church. They persuade Butch, a big bull dog, to carry the egg back to the tree in his big soft lips. It is finally back in the repaired nest and everyone is happy.